When up against a tight deadline, the editing process is the first to get cut short. Your eye is on the prize and that prize is pressing that Publish button right, freaking now. From silly typos to clunky paragraph structure, broken links and incorrectly cropped images, it’s usually the little hiccups that glare the brightest to a reader. 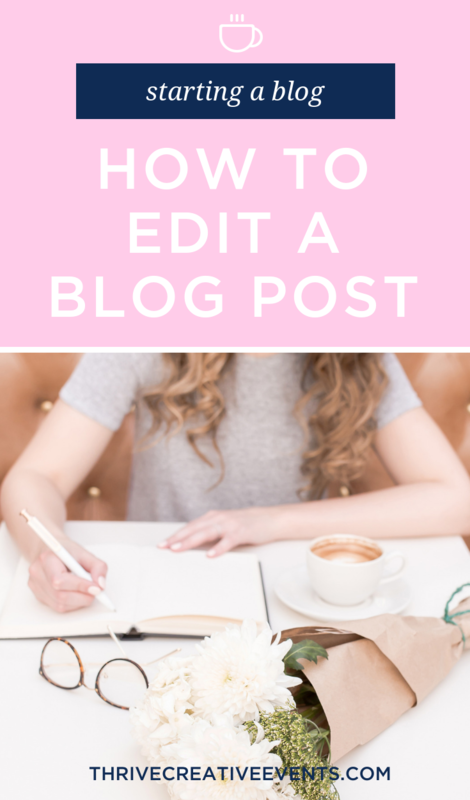 Below you’ll find a checklist including common copy, SEO, and visual tweaks for self-editing your next post. Please feel welcome to manipulate this list to best serve you and help you craft work that shines. It is here to copy, paste, add to, and remove from with the stumbling blocks that best serve your writing process in mind. Fact-check and verify names and titles are spelled correctly. Browse your post for repetitive words or phrases and remove what is unnecessary. Read your article in its entirety to ensure it reads smoothly. Reword areas that read as unnatural. If your blog or the blog you’re writing for has a style-guide, cross-reference and ensure your work is in line with the voice, grammatical choices, and blog-specific details you or the company you’re writing for has established. Ensure your title includes keywords readers will use in searching for what you’re writing. Check that your copy includes keywords relevant to your posts content. Include and verify that all internal links aren’t broken. Include and verify that all outbound links aren’t broken. Embed relevant, high-quality photos, videos, and graphics and optimize with image titles and alt text. Add relevant, engaging, and high-quality images and ensure that they appear crisp and appropriately cropped. If using graphics, verify that all fonts, colors, and brand guidelines are followed for consistency. Scroll through your completed post to check for formatting errors or awkward layout elements. If possible, preview your post on a mobile device to ensure that this version is easy to navigate as well. Use your typography to make content streamlined and easy to digest with headlines, sub-headlines, bold, and italicized text throughout your copy. Don’t edit immediately after writing. Take a breather before you dive straight into editing. You’ve spent some time with your content and a change in scenery will ensure that you don’t breeze past errors or adjustments from fatigue. Don’t over-work it. Editing is important, however, there is such a thing as too much of a good thing. If you agonize over your work, manipulating it in pursuit of perfection, you’ll likely lose your voice in a sea of technicalities. Take the time needed to catch mistakes, but don’t make yourself crazy. Use the inverted pyramid. Edit your work to capture your audience right away with content that includes the most important details way up front. Then you can work your way into the less important (but still relevant!) details. There’s no shame in this. Awareness of where you stumble actually gives you a leg-up and allows you to triple check the elements that you historically struggle with. Don’t get cocky. The worst thing you can do is believe that you’ve achieved perfection and no longer need to take the time to edit. You’re a human. I’m a human. And we will continue to make very human mistakes forever and ever, amen. Editing is far from the most glamorous part of our work, but arguably one of the most important. We’ve all been on the other side of the computer, head in our hands because someone called us out on an absolutely ridiculous typo or grammatical error, right? Let’s get real in the comments. What’s your most embarrassing editing mistake?